All of these pumps can now be used in high-pressure, continuous-duty LPG auto-fuel-dispensing applications. The design of Blackmer's LGL150 pumps is smaller than traditional models, allowing them to offer reduced flow rate for auto-gas dispensers, reduced horsepower requirements, and use with C-face single-phase motors. They are suitable for use in high-pressure and continuous-duty operations. The LGL154A pump model is designed for single-hose fuelling. It has a flow rate of 11.2 gpm (42.4 lpm), maximum differential pressures of 140 psi (9.6 bar); maximum speeds of 1,750 rpm; and three-HP single-phase or three-phase motors. The LGL156A is designed for dual-hose fuelling and has a flow rates of 21 gpm (79.5 lpm); maximum differential pressures of 160 psi (11.0 bar); maximum speeds of 1,750 rpm, and 5.0-HP single-phase or three-phase motors. Both the LGL154A and LGL156A models feature replaceable liners that are equipped with Blackmer’s patented cavitation-suppression technology, a new inboard head that allows the C-face motor bracket to mount directly to the pump head, and a shaft that is 1.4 in longer to allow the same shaft to be used with several different motor-frame sizes. The upgraded LGL158B model has been designed for high-pressure dual-hose fuelling and in underground LPG storage applications. 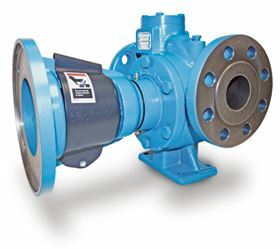 The pumps have a flow rate of 32.3 gpm (122 lpm), maximum differential pressures of 200 psi (13.8 bar), maximum pump speeds of 1,750 rpm and 6.5-HP three-phase motors. All Blackmer LGL150 Series pumps are UL-listed for use in LPG, butane and anhydrous ammonia applications.